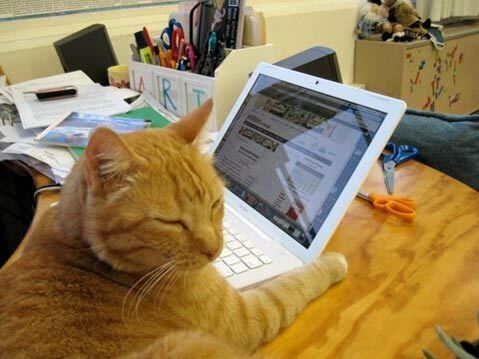 Although Rex likes spending his days at Marymount, he does have a real place to call home. Rex was adopted by Dorothy Sewell, who unfortunately lost her house in the Jesusita Fire. As fate would have it, Dorothy and Rex are renting a place right across from Marymount. Despite his owner’s efforts to keep him home, Rex seems to prefer the company of children. Sewell said every morning Rex will scratch on the front door and meow when it is time for school. Then he walks up the sidewalk and joins the kids to play before school starts. Then Rex comes out again for recess and lunch. Rex seems to know exactly when it is okay to come by and play with kids. In the event that Rex oversteps his bounds and tries to enter classrooms, Sewell brought all the teachers squirt bottles so they can politely remind him that classrooms are for humans only. Though that doesn’t mean that Rex won’t stop trying to go where he doesn’t belong. Last Friday night, Rex wandered into Battistone Hall during the Middle School dance. He crept in during a break between songs, but once the music came on and he realized he was interrupting a party, Rex bolted out. The kids continue the conversation about Rex even after school. Parent Elizabeth Hansen told me that her son Theo talks about Rex at the dinner table non-stop. She said the conversation includes all the funny places Rex goes on campus, and usually ends in giggles as Rex is quite a character. Elise Marie Meyer told me that her son was excited when Rex showed up for his Pack 31 Cub Scout meeting held at Marymount. Rex even walked up the path on his own to be part of the St. Francis Prayer Service. I think Grace Blakenhorn, a Marymount second grader, summed it up perfectly when she exclaimed, “Rex is a purrr-fect cat for Marymount!” I couldn’t have said it better myself. Marymount will be holding a book fair at Chaucer’s Book Store on Wednesday, October 21, 7-8 p.m. A portion of the proceeds from the book, entitled Marymount’s Meow, will benefit Marymount. I’ve had the pleasure of viewing this heartfelt book and I would recommend it to any animal lover! K-9 PALS is holding their First Annual Great Ball Drop, in association with the Santa Barbara Beer Festival, Saturday, October 17, 4:45 p.m. on the softball fields of Elings Park. This is their primary venue for raising funds to provide care and medical assistance to the dogs at the Santa Barbara County Animal Shelter. Proceeds will also benefit the Elings Park Foundation. One thousand numbered balls will be dropped “from the sky.” Some balls will fall into prize-winning dog bowls, others retrieved by “prize-selecting” shelter dogs. It’s guaranteed to be something spectacular to see. Prizes include brunch for two at the Four Seasons Biltmore; Elings Park EPDOG tags; one month pass to the Santa Barbara Athletic Club; iPod Mini Shuffle; and many more. Grand prize is a two-night stay at the luxurious Four Seasons Hotel in Las Vegas with $100 spending money. The price for the ball drop is 1 ball for $10; 10 balls for $90. You can purchase balls by calling K-9 PALS at 681-4369 or stop by the Santa Barbara County Animal shelter at 5473 Overpass Road. For more information on K-9 PALS, visit www.k-9pals.org. Members of the public interested in getting their dog or cat spayed or neutered free of charge should contact C.A.R.E.4PAWS at 968.CARE (2273) or info@care4paws.org to reserve a spot. C.A.R.E.4Paws, short for Community Awareness, Responsibility, Education, started its spay/neuter program with the goal of reducing the large population of unwanted dogs and cats in Santa Barbara County. To learn more about C.A.R.E.4Paws and its different programs and upcoming events, visit care4paws.org. Bronte came to the shelter nearly a year and a half ago as a youngster. She is shy, but who wouldn’t be after growing up at the shelter. 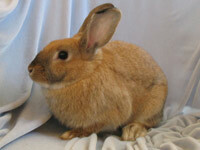 She is a pretty rabbit, and would become a nice addition to a family if given a chance.